In 2002, after her graduation from the conservatory of Alkmaar, department Guitar Jazz & Pop, Eveline van Kampen wanted a band to give the music in her head a concrete voice. 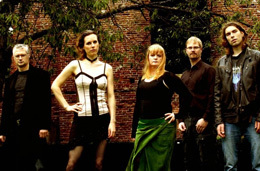 Illumion is progressive, symphonic rock music with definite feminine edges. Historical and literary themes form the basis for the lyrics, closely interwoven with the mysticism of the human mind, creating a world of intangible fantasy. Electric and acoustic guitars, Erhu, mandolin & backing vocals. 6-string fretted and fretless bass, Stick, double bass, Taurus3 & backing vocals. Keyboards, acoustic & electric guitars, guitar-synth & backing vocals.